If your data, services and processes become compromised, your business can suffer irreparable damage in minutes. 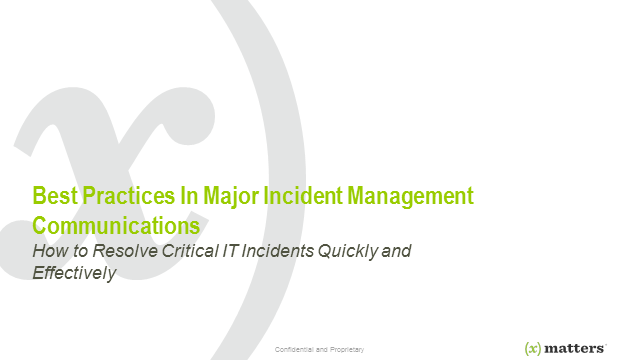 The clock is ticking, and how fast you communicate to your major incident resolution team is everything. Join Scott Bowler, Manager of IT Delivery Management Services, NBN Co, and Abbas Haider Ali, CTO of xMatters and learn how NBN Co identifies major incidents and uses best practices for automating their communication processes to resolve major IT incidents quickly and effectively. What sets high-functioning IT organizations apart from the rest? That’s something every IT leader wants to know. After all, we live in a highly competitive business climate and IT performance can be the difference between success and failure. To conquer the challenge, we need to be informed and collaborative and we need to do this in a cost-effective manner. In this webcast, you will hear from two experts on some of the technology that’s driving today’s high-functioning IT organizations. Find out how your company can be aligned, agile and ready to respond to ever-changing business requirements and competitive pressures.